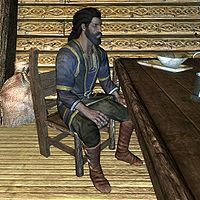 Captain Avidius is a Redguard Penitus Oculatus who is found on The Katariah during the quest Hail Sithis!. He wears clothes with a pair of boots and is armed with an Imperial sword. He carries the Katariah Master Key, along with two leveled potions of restore health and at least 25 gold. This page was last modified on 13 February 2014, at 20:47.